The killer-dolphins will be trained to attack enemy combat swimmers using special knives or pistols fixed to their heads, the source said. "We are now planning training exercises for counter-combat swimmer tasks in order to defend ships in port and on raids," he said. The dolphins were originally part of the Soviet Union's Black Sea Fleet, and were handed over to Ukraine when the USSR broke up, along with their trainers. To keep them active, they were assigned to "therapy"-type programs with children. But now they're back in service to the war effort (not that Ukraine is at war with anyone, as far as we know), and the navy is now "planning training exercises for counter-combat swimmer tasks in order to defend ships in port and on raids." Several exercises have already been carried out this year with the dolphins in finding underwater weapons, both in the aquarium and outside it. "The mission was successfully carried out. Our dolphins found the items and attached devices to them which were fixed on their heads, after which a buoy on it was sent to the surface to mark it," the source said. The dolphin patrols the harbor, escorted by its handler. If the dolphin encounters an enemy diver, it comes back and rings a bell on the side of the boat. 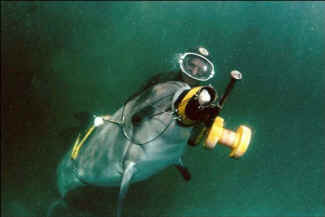 The trainer places a conical marker buoy over the dolphin’s snout. The dolphin then "tags" the swimmer: the buoy floats to the surface, flashing a strobe light to mark the location for security forces. The dolphin swims back and jumps into the boat with its trainer. "The security forces handle the situation from there," says [public affairs officer Tom] LaPuzza, emphasizing that the dolphin has no role in what happens after the diver is located. 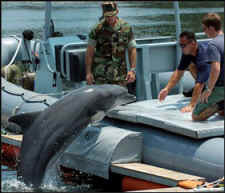 It has to get out of the water is that the security forces are quite likely to use explosives or other acoustic devices which might harm the dolphin. The Navy also employs sea lions who can locate enemy intruders and attach a clamp with a long line so the intruder can be hauled in. Training dolphins to pull face masks off of divers and force them to the surface. Arming them with .45 caliber bang sticks. Arming them with large hypodermic syringes loaded with CO2 gas that would cause an enemy diver to explode. ... as well as having them attach mines to enemy ships. There are also reports, like this one from the BBC, that some dolphins from the Soviet era have been sold to Iran. We would only comment that if we humans can't get along with each other and want to devise ways of destroying each other, that's our own business – but leave the other animals out of it. No more dolphins, horses and dogs in the battlefield. No more trying out bombs and bullets on pigs. No more destroying forests, deserts and other fragile ecosystems. They are not "collateral damage." They are living beings with a right to live those lives without human interference.